What are the unique benefits and challenges involved with being part of a multi-chapter organization? And what do chapters and HQ really want from one another? These are some of the questions that prompted us to conduct our Multi-Chapter Benchmarking Survey in June. While we recognize that most associations and non-profits face challenges in engaging and growing their memberships, organizations with multiple chapters have additional layers or levels of relationships to manage and maintain. So we launched our survey to shine a light on the specific advantages and hurdles that organizations with multiple chapters, branches or affiliates face. We are just completing our analysis of the survey findings for our report – which will be available in late September. But generally, the findings indicate that while there are many challenges for multi-chapter organizations, there are so many benefits for both sides as well. The survey participants made it clear that chapters benefit from the “brand recognition, national or global reach”, as well as access to resources, available through their central organization. At the same time, having a local presence – through a chapter, branch or affiliate – is also extremely important to members and is instrumental in “helping grow the organization”. sharing of ideas (as well as resources). But the key message or theme that ran through the survey responses - is that all multi-chapter organizations have both special, and often complicated, relationships between the central organization (or head office) and the chapters. In fact, we were thinking about calling this post: “Darth Vader’s Guide to Multi-Chapter Relationships”. But after reviewing the frank responses from both sides of the multi-chapter equation, we don’t think there is an actual “dark side” to the HQ - chapter partnership. It’s just that, like all relationships, it’s all about perspective, communications and priorities. When reviewing our survey responses, we came to understand that just as Obi-Wan advised Luke Skywalker (in Star Wars: Episode 6 – Return of the Jedi), we found that "many of the truths we cling to depend greatly on our point of view." What our survey confirmed is that while the central organization (or head office/ HQ) and their chapters share a vision and mission as well as a desire to serve their members, often their perspective, priorities, available resources, practices, and procedures may differ. So we were careful to design our Multi-Chapter Benchmarking Survey to ensure we offered information as well as insight from both a chapter and central organization perspective or point of view. And as you can see from our infographic describing our survey respondents, both sides were almost equally represented among our 121 survey respondents – with 56.2% - representing a central organization (or HQ) and 43.8% - representing a chapter, branch, or affiliate. We were also pleased to have almost equal representation from organizations with regional, national or international reach and a broad range of organizational sizes in terms of total membership as well as number of chapters – offering a well-rounded perspective. In addition, the individual survey participants hold a wide range of positions in their organizations – from President to Board Chair through to website manager. If you want to receive the full Multi-Chapter Benchmarking Survey Report (later this month) – you can register here: https://www.wildapricot.com/multichapter-benchmarking-survey. 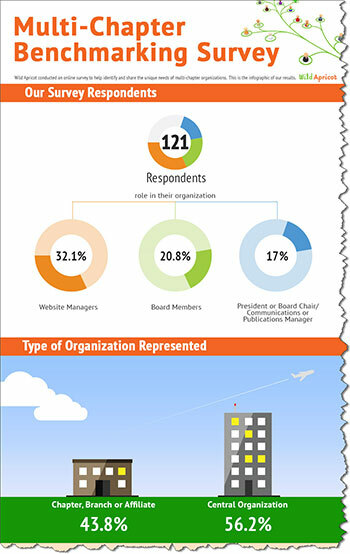 In the meantime, stay tuned to the Wild Apricot Blog through September to hear more about our survey findings and the insight we’ve uncovered on organizations with multiple chapters, branches and affiliates.